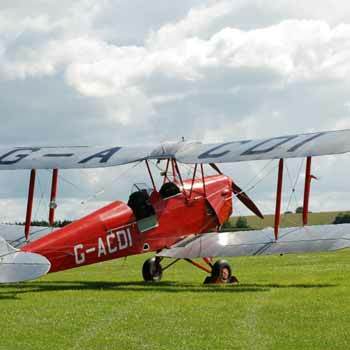 The Tiger Moth is a superb little biplane, designed by Geoffrey de Havilland and introduced in 1932 that, although retired from active service with the RAF in 1959, stands the test of time and is a delight to fly in even today. 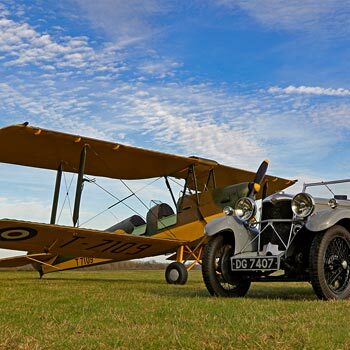 I’ve chosen this Tiger Moth flight because it’s from a great, reliable company and it’s a cracking price! 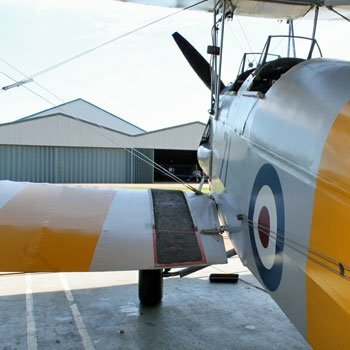 Manufactured near Oxford in England and in Canada, this aircraft is just 7.29 metres long and was the Royal Air Force’s primary trainer, the one on which pilots of all kinds learned before moving on to more demanding planes. In addition, of course, the Royal Canadian Air Force also made extensive use of it, as did the ones of Australia and New Zealand. So its ambit was decidedly worldwide. Spitfire pilots, for example, mastered the skies in the Tiger Moth before moving to fighters during the Second World War. 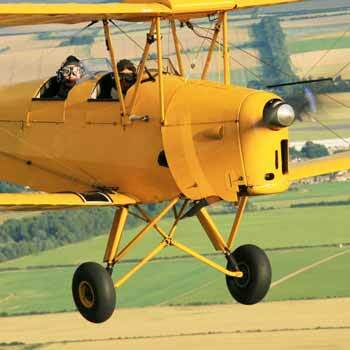 And the longevity of this plane – from 1932 until it was replaced by the Chipmunk in 1959, shows what a highly-regarded all-purpose craft it was. This airplane was designed as a variant of the original Gipsy Moth to Air Ministry specs to serve as an all-purpose trainer for those who had never left the ground before. And in these days of routine trans-global flights, it’s hard to imagine that most would-be pilots had never even seen a plane let alone flown in one! And an interesting requirement was that the front-seat was designed so that its occupant could escape easily wearing a parachute. The engine output of 120 horse power is, you won’t be surprised to hear, less than that of most of the cars on the road today. And yet thousands of people still enjoy pleasure flights in this little beauty with perfect confidence. 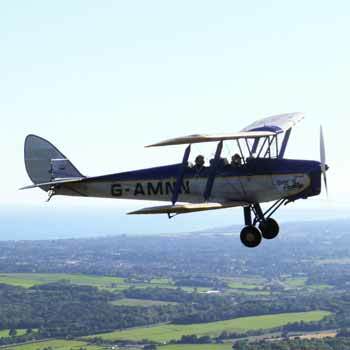 It’s a popular vehicle for recreational flyers as many of them were sold off in excellent condition when no longer needed for Armed Forces duties, and it proved to be easy to handle and easy to maintain. 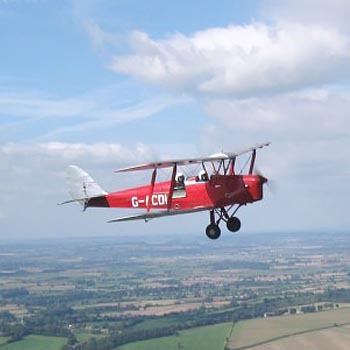 A staple of the aerial tours business, this plane is a delight to fly in and widely available. You can read more about the Tiger Moth on Wikipedia. Well firstly, this plane flight isn’t like the one you’d take to the USA, Australia, Ibiza or even Benidorm! It’s a biplane, with two sets of wings located over each other, and an open cockpit for you to sit in rather than an air-conditioned cabin. It seats two, you and the pilot, with no room for luggage and the minimum in home comforts. So if you want hostess-service, then you’ve definitely come to the wrong place! No, it’ll be just you and Mother Nature with the wind whipping round your head and you will be able to look right over the side to an unobstructed view of the earth passing in a leisurely fashion below you. With a cruising speed of 75 knots (about 86 mph), you won’t be threatening the sound barrier any time soon, so will have plenty of opportunity to examine and admire the landscape from above. And as the passenger, you’ll sit in the front with the pilot behind you. Oddly, this is the normal seating positioning for biplanes (with some exceptions) and is just the way the planes were designed. The most popular explanation for this is that when flying solo, putting the pilot in the rear of the two seats gives it a more central centre of gravity. All flights are driven by qualified pilots, of course, and basically on a pleasure flight trip you tend to get what you pay for in terms of time. The more you pay, the longer you get in the air. Don’t forget you’re paying for the fuel, the pilot’s time on a one-to-one basis, and a contribution towards the maintenance of the plane which will need to be carried out after every fixed number of hours flight time. The experience you choose will tell you how long you get in the air, but there is generally a minimum of 15 minutes airborne, which should be plenty to give you a feel for flying Commando! Firstly a safety briefing, which is essential to make sure you come up and go down in one piece. Then it’s chocks away! (the chocks are the little wooden wedges that stop the wheels from rolling while on the ground) and before you know it you’re in the air. If a spell at the controls is in order, then over your headphones will come the phrase “You have control” and you’ll take over the plane and be able to put it through its paces yourself. The real pilot, of course, will keep a careful eye on progress, give helpful hints and advice, and be ready to take control back at any time. So you’ll be totally safe while you’re having fun. And it’s often the case that after one of these introductory flights, people find they’ve got a taste for it and go back for longer ones. 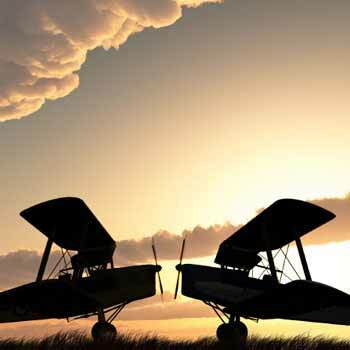 Or even take it up as a hobby and go for their own private pilot’s licence! Once you’ve tried it, you’ll see why.